Masks have been around since ancient times, incorporated into ceremonies, rituals, performance, and play. This universal art form is all about the exploration and communication of persona. Through the metaphor of the mask, you have the opportunity to consider the MANY parts of yourself, including those you reveal to others and those kept concealed from the world. As promised last week, below are some art therapy directives involving mask-making. Give one (or all!) of them a try. These can be really useful exercises in increasing self-awareness and self-acceptance. As you create, issues may come to the surface that could benefit from further attention. This is a great time to reach out to an Art Therapist for additional processing and support! There are many different types of masks you can use to explore the below directives. I've listed the directions and materials for 3, including a tinfoil mask, cardstock mask, and plaster mask.Create the form of your choice and scroll down to see the art therapy directives. Let the exploration begin! Overlap 3 sheets of aluminum foil in a stack. Push the stack of sheets firmly onto your face. Make sure you have the general outline of your face imprinted (nose, lips, corners of your eyes and cheekbones). Using a marker, trace around your eyes and any other areas (mouth, nostrils) you want cut out. Cut around the edges of the mask. Carefully cut out the eyes and any other breathing holes. While pressing the back of the mask to your face to keep the features strong, gently place strips of tape onto the front of the mask. When you feel the mask's features are firm enough, place tape overlapping across all visible places of foil, including the back. Draw a large oval face on your piece of cardstock. Cut out the face. Draw on 2 eyes (mouth and nose if you want). Cut out. Attach the popsicle stick to the bottom using tape. Cut bandage plaster into strips of varying widths and lengths. Construct the first layer of your mask. Using 1 strip at a time, dip into your bowl of water, then run your fingers over the strip to remove excess water. Lay onto your plastic mask, smoothing the pores out of the plaster with your fingers. Use this same process to apply the rest of the strips, completely covering the mask. Create an even base layer. Add a second layer of plaster strips to your mask. Try to create a uniform layer with as few bumps as possible. Optionally, use extra plaster strips to build up any features you want more prominent…create a bigger nose, eyebrow ridges, add more character, etc. Let your mask dry completely. Remove from the plastic template. Cut out eyes. #1 Our many masks: Throughout the day we wear a multitude of masks. A professional mask at work, a distancing mask with strangers, a nurturing mask with loved ones…the list goes on and on. Make a list of some of your own masks. Pick out two that represent contrasting traits. Take your chosen mask (created from list above) and using art materials of your choice (paint, markers, collage, etc.) create your 2 contrasting “masks” on either side (inside and outside). These can be abstract images or realistic faces, there’s no right or wrong way! Use your creativity to explore the metaphor and gain a deeper understanding of yourself. #2. Past self/Present self: Use mask-making to explore your past self/where you've been, and your current self/where you currently are. To start, do a brief writing exercise reflecting on these 2 aspects. Then, take your chosen mask from above and using art materials of your choice (paint, markers, collage, etc.) create your past mask on the inside and your current mask on the outside. Observe the differences and similarities. #3. 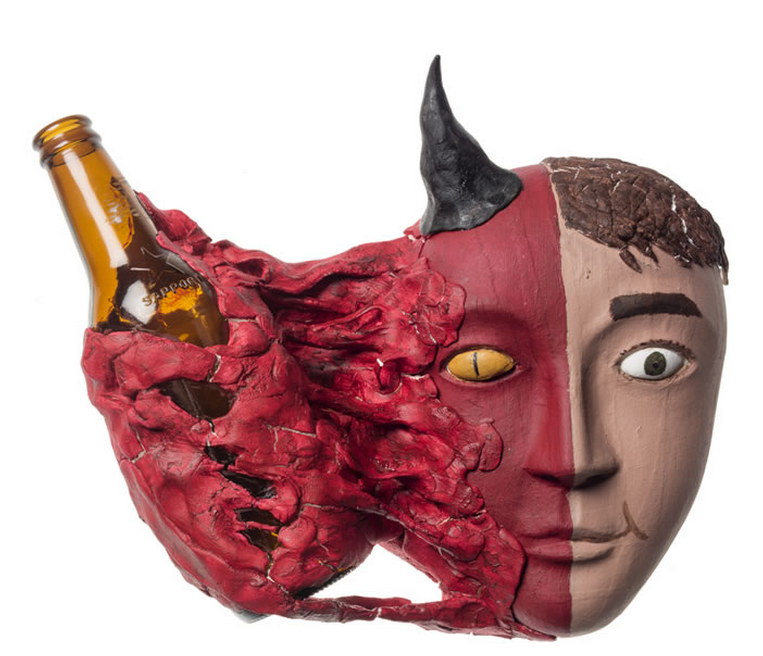 Others vs. Self: Because a mask has both an inside and an outside, it’s a perfect vehicle to explore how others/the world see’s you (outside of the mask) vs. how you see yourself/really feel (inside of the mask). Often, there are many disparities between these 2 personas. Take some time to consider these 2 ideas, exploring how to represent them on your mask using the art materials of your choice (paint, markers, collage, etc.). Then get creative, letting the metaphor guide the way. With the days getting longer and temperatures increasing, it feels like we're almost done defrosting, out from hibernation with a renewed sense of energy and purpose. The last of the snow piles are finally melting away, revealing hidden sidewalks and fresh soil. We've made it...spring is almost here:) There's a bounce to your step, and everything feels lighter. Leave the runny nose and frozen fingers behind and reground with a fresh intention. What better way to do this than by creating an intention stick as a visual reminder. Incorporating nature into your artistic process is a great way to ground as you create. Everything in nature is unique...a different shape, size, and texture, which translates into your artwork and also serves as a metaphor for yourself. Begin by taking a walk outside...pick a park or your favorite block, ideally somewhere without too much hustle and bustle. If possible, take a moment to close your eyes. Feel your feet against the earth. Breathe in the fresh air and notice any smells. Listen to the sounds that surround you. Observe your natural soundtrack. Feel the breeze and warm sunlight against your skin. Let this moment influence your intention. What word(s) come(s) to mind? What would you like to set as an intention as you start off the spring? Slowly open your eyes and take in your environment. Notice the colors and shapes. Begin walking with intention. Collect some branches and twigs, which you'll use in your artwork. -Select your favorite branch or twig. Return to your intention, and write this word or words on the wood using a writing utensil of your choice (or paint). You can optionally paint 1st underneath. - Take your yarn (string, twine, ribbon, etc.) and begin to wrap around the stick. Feel free to alternate colors and textures, making it unique to you. Find relaxation in the repetition of the wrapping, keeping in mind that you are setting or securing your intention in place. What a great way to begin the spring! - Using paint (or any extra embellishments) add any additional details to your stick. Many start the New Year full of conviction, determined to turn over a fresh leaf, take-up new hobbies, kick bad habits...you know the drill. Often, by this time in January, that motivation starts to slowly subside. The once strong and solid resolutions are replaced with excuses, avoidance, and guilt. It's just so much pressure! Instead of focusing on the end result, try to be in the present moment. Check out the following article, with 9 creative art therapy directives for the New Year. These will help you be in the moment and authentically transform!